Happy Monday! I’m over-the-moon excited to show you the dresser that I painted this past week. I originally bought it from the ReStore for my boys’ room, but now it’s in our dining room as a buffet. I love, love, love this piece. Well, it didn’t start out that way. Here’s the before. It was in pretty good shape as far as the construction of the piece. The finish was another story…especially on top. I took all the hardware off and decided to leave it as is. 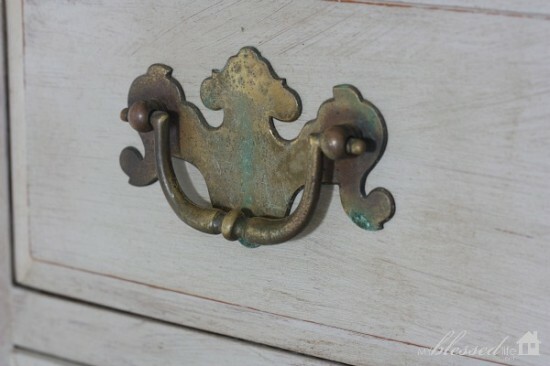 I’m kind of digging the fabulous brass patina. My lovely friend Shaunna from Perfectly Imperfect sent me Annie Sloan’s Paris Grey Chalk Paint as well as clear and dark waxes. I’ve never used ASCP on furniture before, but I just have to say that I LOVE this stuff! I painted everything with one coat of Paris Gray and let it dry. And then I used clear wax. I brushed it on and rubbed it in and off with a cloth. It’s important to use just a little clear wax, so that it can dry and cure properly. I gave the dresser a bit of distressing here and there before waxing with dark wax. Then I dry brushed dark wax over everything and I focused on getting it into the crevices. This is an awful picture taken at night, but you can see the difference between the dark wax all around the bottom and the rest of the dresser that just had clear wax on it. Light distressing on the edges. I love how the top turned out. The finish is beautiful! I’ve dreamed of having a piece like this in my home for a long time. Sometimes you just need to DIY it! I love the brush strokes. I’m continuing to work on the dining room bit by bit. I hope to have it complete and ready to “reveal” in the next few weeks. Yay! 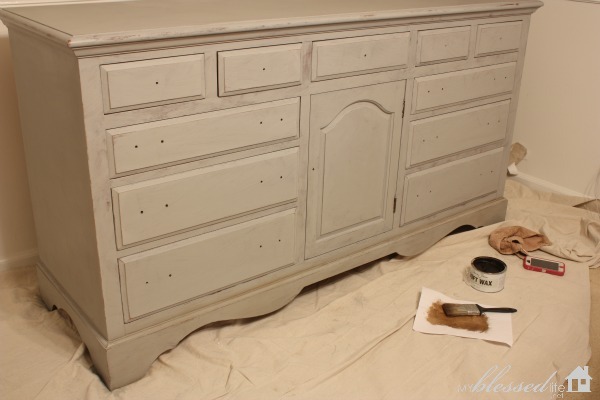 Have you ever used Annie Sloan Chalk Paint before? 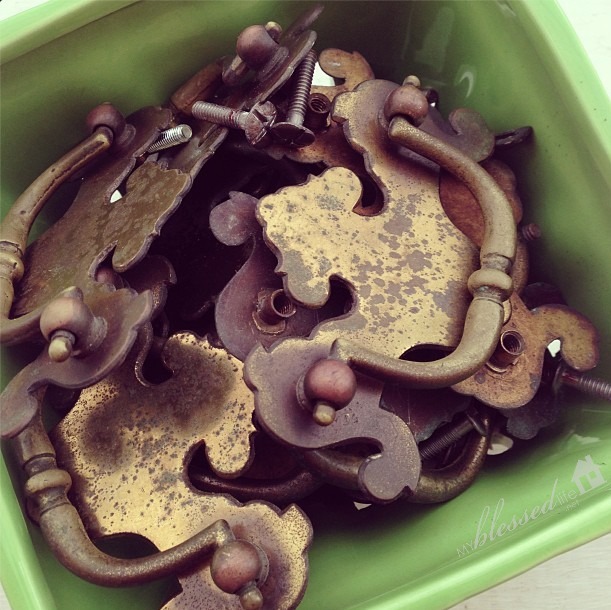 Sharing at: Tips & Tutes, Miss Mustard Seed, Chic & Crafty, I’m Lovin’ It, Before & After Party! Where can I kind the chalk paint and wax? 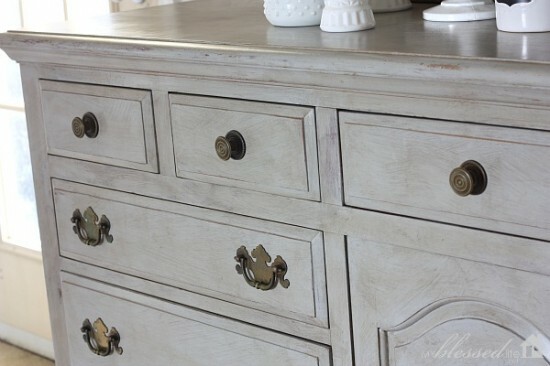 Where can I purchase the chalk paint and wax? Also, is there any paint stripping or prep to the wood prior to using the products? Go on line and find a location by you. No prepping is required. 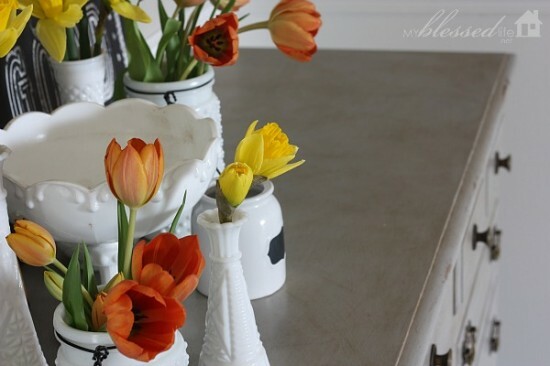 You can also DIY by adding calcium carbonate to any paint. Also Lowe’s carries their brand of chalk paint and wax. What color paint please, I love it. This buffet looks awesome, you did such a great job!!! I have to ask about that amazing picture in the back though. Where did you get it? In in love! The Chalkboard Art is from TJ Maxx – I have the same one 🙂 I got it a few months ago tho! It is beautiful!!! Where did you get the Chalkboard Art? I love it. I got it a few weeks ago on clearance at TJMaxx! Wow, this looks amazing…I just ordered some AS paris grey and now I’m even more excited to know that the color is most lovely…I love it! Great Job! Oh, Myra! Your buffet turned out so beautifully! You’ve done a fantastic job and with little guys to care for through it all! I love the old hardware that perfectly finishes off the paint job! Gorgeous and you are right, digging the old hardware. I love Annie Sloan. I have gone on a painting binge in our house with all her colors, but haven’t done the dark wax yet. I definitely need too. Wow! I love the new look! I have never used it before. What an awesome project. How long did all this take to complete? What really caught my eye though was your positive affirmation poster. I love it and my last post was about just that. If you would like to link your post up with us we are looking for people who post the good, positive things in life and not just the negatives all over their blogs, Facebook, Twitter etc. 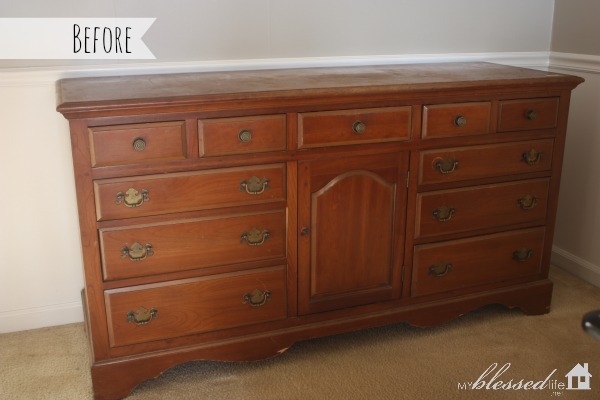 This makeover took only one day! 🙂 Chalk paint rocks! I think it looks wonderful! I love it!! I have a question – what was the finish like on the dresser before you painted it? I was given a dresser this last weekend that I’d like to refinish, but it has the glossy finish on it, so I’m not sure if it’s a good candidate for just painting. (I obviously am not a very crafty person!!) But I’ve heard great things about that paint, and am hoping that it will work because this is gorgeous! I was thinking the same thing about glossy finishes. Where do you purchase this paint line? I have several things I would love to paint but was afraid of how to start. Love your ideas and blog. 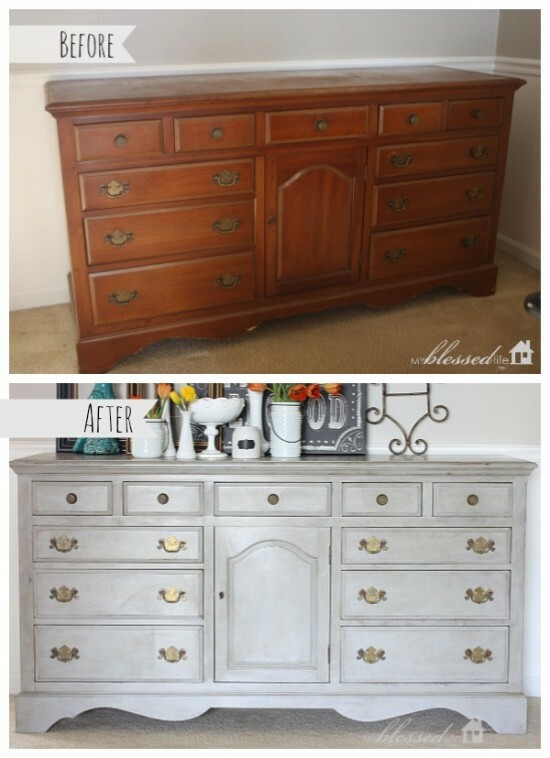 This is beautiful, I found your dresser on Pinterest! Absolutely LOVE the way it turned out!!! Thank you for the shout out! Shaunna´s last blog post ..why not? Looks beautiful Myra! I’ve been wanting to try ASCP…. I think now I will. I bought these end tables (solid wood) from a thrift store and I stripped them already… just need to decide what to paint them with. 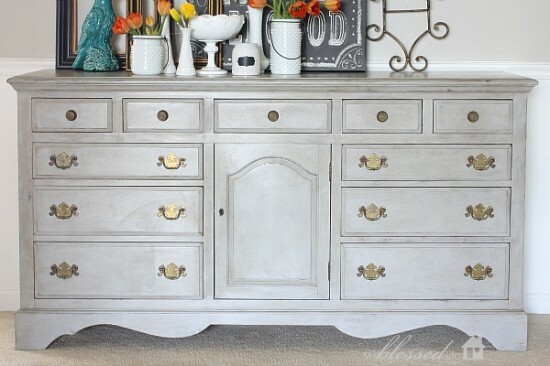 I think I’ll try chalk paint… love the look of yours. Thx for sharing! Myra it’s GORGEOUS!! and I love the way you decorated her too!! This is EXACTLY what we are looking for in a new (to us) media console. Love the color! Thanks for posting! It looks wonderful Myra, and the way you arranged the tulips is so pretty. That inspired my flower arrangement today. Thank you! It looks amazing. You did a great job. I myself am in the process of digging out an old dresser from my son’s closet to redo. Like yours..its construction is great and solid but its finish ..needs some TLC. I have never used ASCP or the soft wax but this has convinced me to try. I am slow but will send pics when done, Am not brave enough to do the blog thing but love to DIY it. Thanks for sharing. So much inspiration…and dont yall just wanna move with it being so pretty outside…gotta love spring. This is the EXACT piece of furniture (size, color, shape) I have been looking for over the last year! !i am not joking when I say that this is exactly what I have been dreaming up in my mind! It was almost spooky when I saw it! I can’t find a store/ website with anything like this-I WANT IT!!!! Over the last month I realized that I am going to probably have to do it myself. Question: why do you have to use both colors of wax? For depth? Why is it called chalk paint? Thank you for the inspiration!!! I have the same questions Michelle. 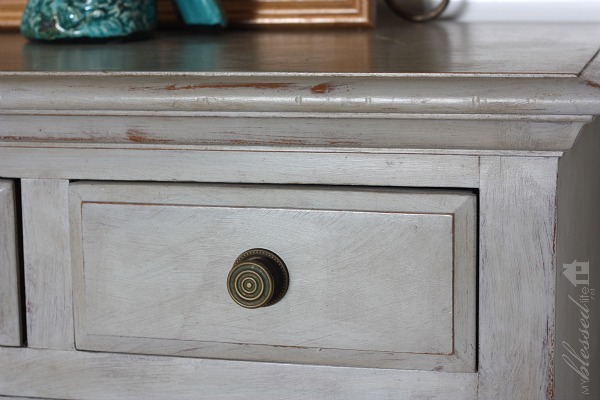 I’ve redone a lot of furniture but never have used chalk paint. I want to know how it’s different from water based paint and how it could be done in ONE day. I’d have more furniture painted if it only took me one day to complete! 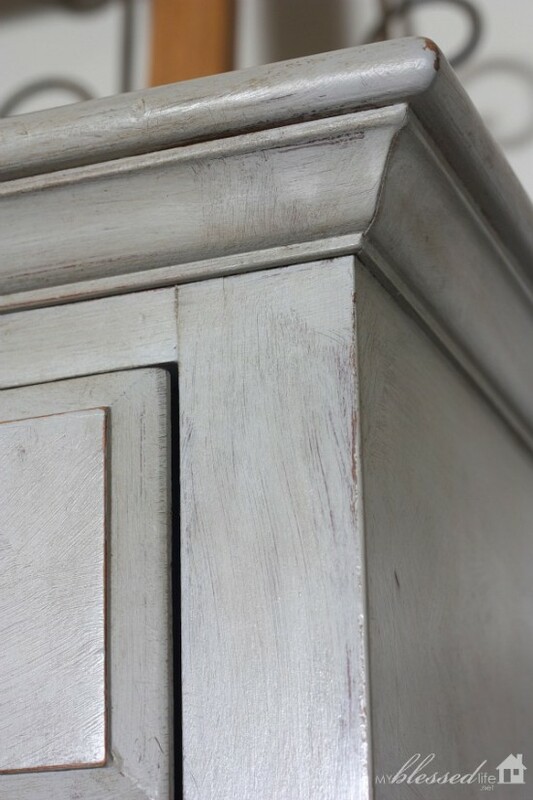 I love love love love love (you get the picture) Annie Sloan paint:) You did a great job! So pretty! I wish I had the talent to do projects like this! I love it! 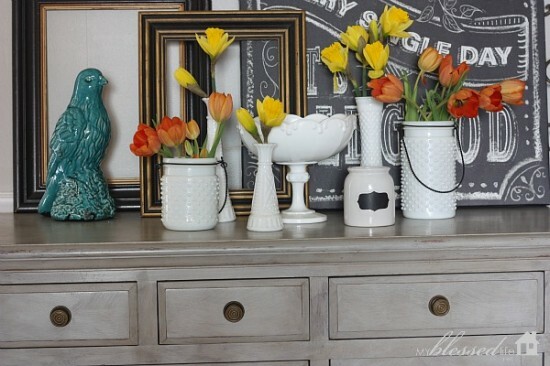 I have an old dresser like this I’m getting ready to redo. Thanks for the inspiration! 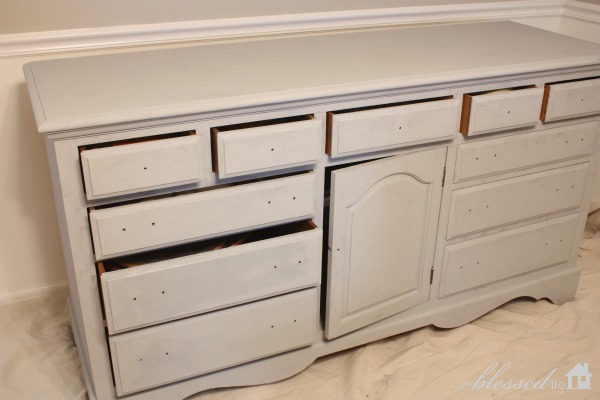 Did you take all the drawers out when you painted it or just pull them out a little? It’s beautiful! I haven’t tried them yet, but really want to! Vivienne @ The V Spot´s last blog post ..Designing your own business and holiday cards using Vistaprint. Love it, it looks beautiful! To let you know this turned out beautifully!!!! Congrats…all your hard work and rubbing were evident in the final photo. I love it, you did an awesome job! This is beautiful! I love the color & that you can see the brush strokes on the surface. Lovely job! Beautiful! I’m impressed you did this with 2 little boys. Some days I feel like I can’t accomplish anything! I am in LOVE with this dresser!! I’m going to get to work on one that I have been hiding in my son’s room for years. Today I’m taking it out and painting it, first I have to go and buy the paints! Off I go!!! Thanks Myra!! You have the best ideas! Looks fabulous. I pinned it to my furniture makeovers board. 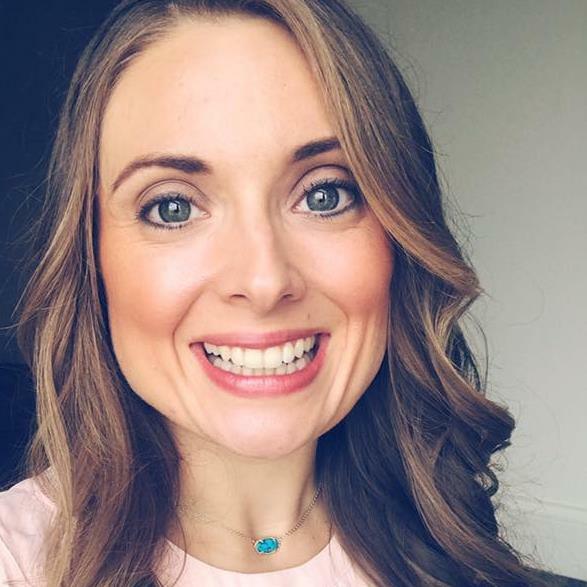 Stopping by from Tidy Mom. Gorgeous, hey did you see the Redbook flower pot idea this month? You take puff paint and dot flower pots with it. Then you paint white to give it the vintage look on the dime. Geneusis, I bet you could find on the Redbook website. I clipped from a Redbook in the dr. office, shhh. Hope you’re having a fabulous weekend! I have to say, it is gorgeous! I am in love with what you’ve done here. I definitely have a few furniture pieces that could use a makeover! Such a good job, Myra. I have some pieces that I would like to paint, but I’m a scaredie cat. It’s gorgeous!! Love the color and love the way you styled the photo. Beautiful! This is so beautiful, Myra! Great Idea for kitchen revamp. 🙂 Now I’m thinking on what can I paint that will totally look fab on our buffet. Paris Grey compliments the color of the top pieces plus lovely flowers! 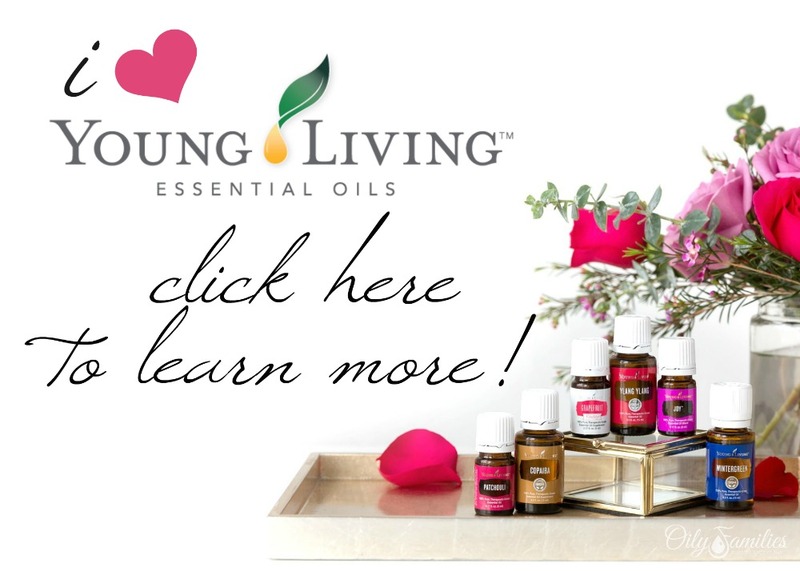 Five stars for your diy! :)) Awesome! Love it. I’m getting ready to paint my first piece of furniture for Emma’s room. It’s a dresser too. I may just take some of your ideas to do it. Great job! 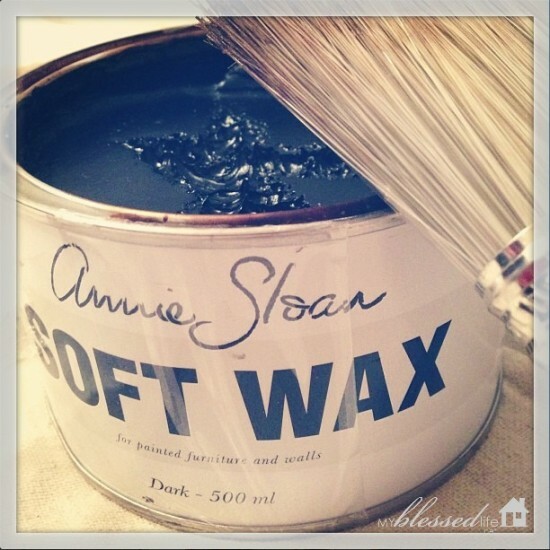 I am totally addicted to Annie Sloan paint and wax!! I have a collection of colors! Instead of flowers my husband will bring home a can of paint and I’m the happiest girl in the world (pretty great husband huh?) watch out in my house if its not painted I’m planning my paint brush attack! Great job again!! Myra!! This is beautiful!! I couldn’t believe it when I stumbled across this post… I just bought that same exact chalk art yesterday!! Found it on sale at Ross for $11.99! I couldn’t believe it! It’s just sooooo cute! Hey Candace! Oh, that’s awesome about the artwork!!! Fabulous! Love this color. Did you have to sand any parts down? I’m getting ready to do this to my 2 dark wood coffee tables, and they have some pretty deep scratches and Knicks on the top. And what did you use to distress? Thank you so much! Thanks for the tips on how to paint it with the distressed look. Loved how it turned out. Where did you get the chalkboard print? I love that too! 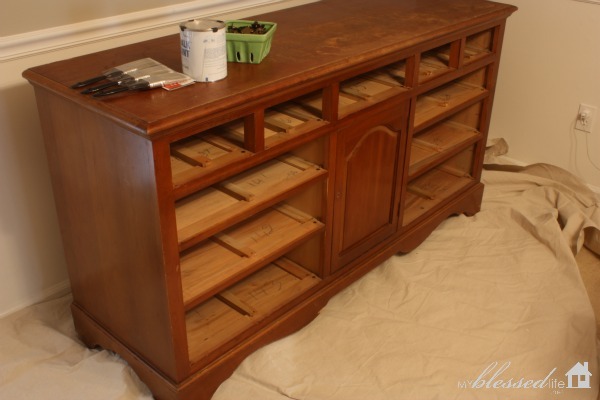 I just found your blog and I have two pieces of furniture I plan to paint but I’ve never done it before. I don’t see where you did any sanding. Do you not have to sand the furniture if you use chalk paint? 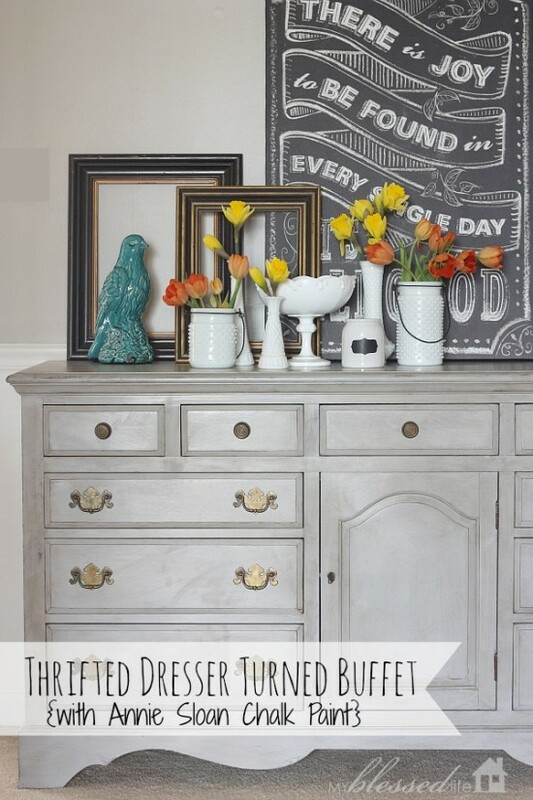 Your dresser/buffet is so beautiful! 4 years later I have a question. I have used AS and the novice I am it was a pleasing finish. After applying the dark wax did you rub it with a cloth? If so how did you keep from spreading which might spread the wax and not have the brush strokes. I love what you did. I would like to use on a desk. Would I have to be concerned that I might rub the wax off. I know someone who bought a piece and as she uses the desk the rubbing her arms the wax was coming off on her clothes and it was very noticeable. Sorry for making this such a lengthy quesion. Thanks for sharing. Looks lovely! I’m so glad people are re-purposing furniture again. When we married just about all we had were hand me downs and we had to find ways to make them ours. We even still have a couple of nice pieces. The book of Ecclesiastes says it all. Nothing is new under the sun. Again, lovely!